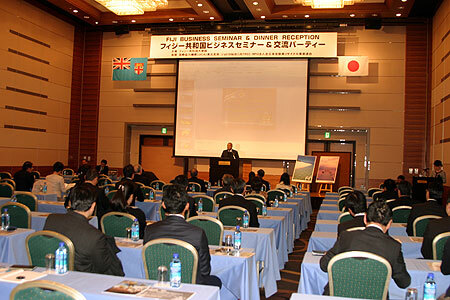 The Fiji Embassy in Tokyo conducted a Trade and Investment Seminar in Sendai City, Miyagi Prefecture on Wednesday, 28 November 2012. As the first ever program as such to be held in Sendai City, the turnout was overwhelming attracting 86 Japanese businessmen and women. The seminar was the joint effort of the staff of the Fiji Embassy in Tokyo and a group of Japanese businessman from Miyagi Prefecture. Ambassador Isikeli Mataitoga in making an opening statement to the seminar stressed the importance of further deepening business relations between Japan and Fiji. In visiting Miyagi Prefecture, Ambassador Mataitoga emphasized the existing relations Fiji has established with the Tohuku Region of Japan. 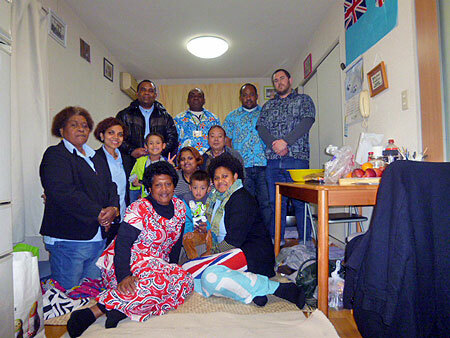 This was when the Bainimarama Government offered 20 scholarships to high school and university students from Miyagi and Fukushima Prefectures who were affected by the Earthquake and Tsunami of 11/03/2011 to study in Fiji for 12 months. He also highlighted the value of people to people exchange in the cultural, education and sports field to start the initial process of more visits from Miyagi to Fiji in 2013. 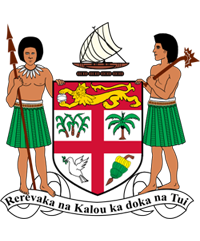 The other presentation made at the seminar covered investment assistance outlined in the 2013 Budget announcement by the Bainimarama government and an overview of the economic profile of Fiji since 2006, highlighting the latest economic data which shows Fiji’s economy growing at a higher rate that was previously estimated. Then there were presentations from two Japanese businessmen who are doing business in Fiji and sharing their businesses and why they decided to start their business there. The seminar was followed by a reception in which participants had an opportunity to discuss issues they wish to raise with Ambassador and other Embassy staff in attendance. The support provided by the Miyagi Prefecture Leading LDP Member of House of Representatives in the Japanese Parliament Hon. Mr Kenya Akiba at the seminar was much appreciated. 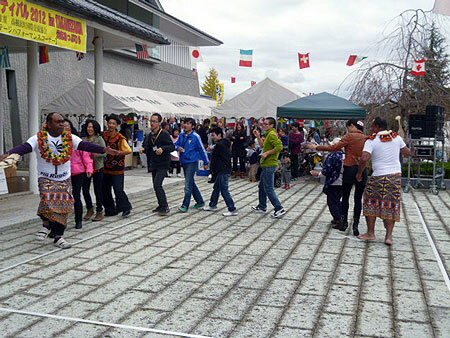 The International Friendship Exchange Festival in Takanezawa hosted its annual event at the Genki-up Mura in Takanezawa town, Tochigi prefecture on Sunday 11th November 2012. Organized by the Takanezawa International Exchange Association for the purpose of international exchanges among the local and foreign citizens in Takanezawa town, the four hour event was enjoyed by everyone. 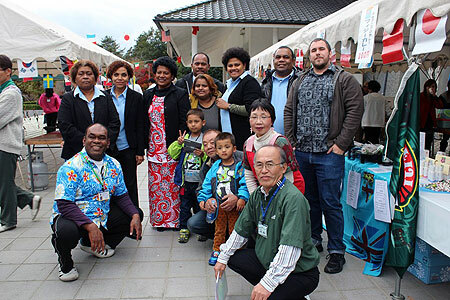 Led by the Fiji Embassy Tokyo, Fiji’s participation included a booth for promotion of Fiji food and handicraft products, and performances of Fijian cultural items such as “meke”, “taralala” and Fijian hymn songs. The Embassy also took advantage of the opportunity and introduce on Fiji`s basic information. It was a tremendous opportunity to further promote people to people exchanges and to showcase glimpses of the Fiji hospitality and the genuine culture that Fiji and its people are renowned for. 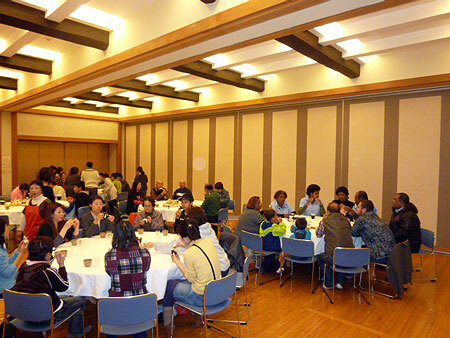 Following the event, Takanezawa Town Council hosted a lunch as well as tea party as a token of appreciation to all participants from respective countries. The Embassy remains optimistic on further strengthening relations with Takanezawa as part of our efforts to build up people to people contacts with Japan through the medium of sister relations between cities and towns in Japan with those in Fiji.